Consuming 250g+ of protein on a daily basis means eating an awful lot of chicken, fish, lean beef etc. Because of pressure with times & family etc, preparing enough meals to get my daily protein intake sometimes just isn’t practical. Also, quite often, I’m just not able to take a break every 2,5-3 hours & eat a small, high protein meal – this is where proteinwhey shakes come in handy.I’ve gotta say that I do view a protein shake as second choice to a proper meal but the convenience of protein shakes more than makes up for this. Although, flavouring & ‘blendability’ has improved over the years, protein shakes are still pretty bland & sometimes I can be knocking back 2-3 per day (especially on gym days with a pre & post workout shake).But who says a protein shake has to be just flavoured powder with milk/water – why not start experimenting a little by adding other ingredients to make their protein shakes taste a little better?You can soon turn your boring, often tasteless, protein shakes into mouth-watering bodybuilding or dieting delights. Before rushing off to your refrigerator to blend everything in site, let’s go through some basic principles you will want to consider first. Not only do you want to create the best tasting shakes but you should also aim to make the most effective protein shakes for your dieting requirements. This is important because there is no point throwing full fat ice cream, chocolate sauce, peanut butter & full fat milk all together to create a wonderful tasting fat gaining shake. You need to be a little wise when choosing your ingredients. Try to keep as many of your ingredients as natural as possible. A good example of this is using natural peanut butter instead of regular peanut butter. The natural version has better protein content & also natural fats that are important in your diet. Fresh fruit should be used whenever possible. Fruit contains the carbohydrates that will fuel your workouts & your day. The complex sugars in fruit are important to any diet (unlike the simple sugars in sweets, sodas, etc). 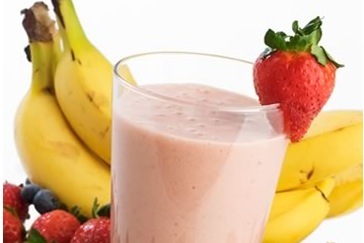 Think about ingredients that will boost your shake’s protein content. For example, you could throw a handful of nuts into the blender for a little extra protein without making the shake much thicker. You could add a few raw egg whites (if you are worried about eating raw eggs you may be able to find treated egg whites in cartons at your supermarket). You could always simply dump an extra scoop of whey powder in there as well. Once you have decided on the ingredients for your shake you are ready to start. It couldn’t be simpler but it is a good idea to think about the order in which you will add your ingredients into the blender. Always add your main liquid source first so that everything else you add afterwards is easily blended. Following this, add your protein powder & give your blender a quick ‘burst’. Now you are ready to add the rest of your ingredients & blend until you get the right consistency. At this point you may want to add a little more liquids to tweak your shake’s thickness. Throw in five or six ice cubes to make your shake more refreshing. Now you can let your imagination invent all sorts of bodybuilding & dieting concoctions that make your supplement shakes a great deal tastier. Don’t forget to share your creations with friends at the gym & people across the world through the internet. You will also discover many ideas other people come up with to inspire you further.